Lucky Frame's brand-new game is a dark but beautiful experience. Surprise isn't a sensation that comes often to anyone who immerses themselves in the steady output of the App Store on a daily basis. It's hard to approach a new physics puzzler, a tower-defense game, or a match-three mash-up without bringing the baggage of past experiences with you. Sometimes though, we're caught off-guard. Your first few moments with Bad Hotel are quite likely to be moments of frustration, and possibly a mild sense of nausea at the color palette. Presented with a crisply drawn tower block in an art-deco world, you're instructed to expand this tower by placing rented rooms upon it. Each room comes at a cost, but they generate income of their own. Your natural inclination is to vertically build the tower as high as possible. Your tower is not alone in this gloomy world though. The flying enemies you first encounter in the game head kamikaze into these rooms, weakening each section's structure health. Eventually, enough of these airborne enemies crash into the central tower, it crumbles and you fail. You try once again, the same thing happens, and for a moment you nearly walk away from the game altogether. 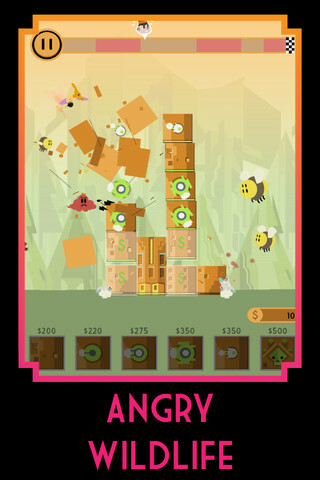 Then you realize can stack those extra rooms onto the sides of the tower block, and the game comes alive. 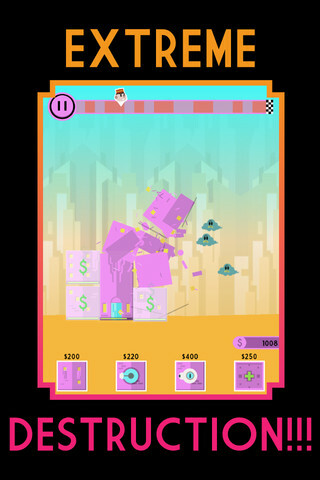 Now you react to the escalating threat, protect the weakening parts of the structure with other rooms, and manage income with expansion until the level timer expires and you survive the level. In later missions, you're given weaponized rooms that may not earn any income, but do a tidy job of annihilating the approaching threats. Weak at first, they evolve into more valuable tools of destruction, and they too require the protection of the simpler, rent-collecting rooms. Enemies likewise evolve, with ground-based units joining the fray, and complicating your strategy. Artistically, it's a migraine blur of orange and black art-deco styling that eventually evolves into something mercifully softer. The game's crisp, clean lines look grimly gorgeous, particularly on the larger screen of the iPad. In the soundtrack, there's a procedural mish-mash of tunes created by your humming rooms as they collect rent, the 70s sci-fi kids TV show bleatings of the enemies, and an ominous heartbeat that thumps endlessly away in the background. It's indescribable, but more than worth a dollar to find out for yourself. 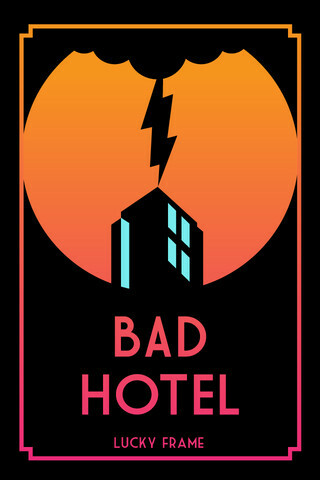 Bad Hotel is, in short, the stuff of wonderful nightmares: an eerie soundtrack, a menacing palette and an all-pervading sense of inescapable doom. Yet it's also one of the most original and atmospheric tower-defense games we've played all year, and if you value the hard work of a development team fighting against the status quo of crayon colors and physics puzzlers, you owe it yourself and to them to play it. What's Hot: Unrivaled atmosphere, and a genuine, honest-to-goodness unique take on the tower-defense genre. What's Not: The early moments of the game may simply confuse, rather than engross. Stick with it.